What's the Deal with Teens and Time Management? What’s the Deal with Teens and Time Management? The title basically says it all. What’s the Deal with Teens and Time Management? I’ve been wanting to know this about both of my boys. C.J just turned 13 in February, but his time management skills aren’t all that great. It gets to the point where I tell them that if there was a fire they would be in trouble. They take their time doing EVERYTHING. 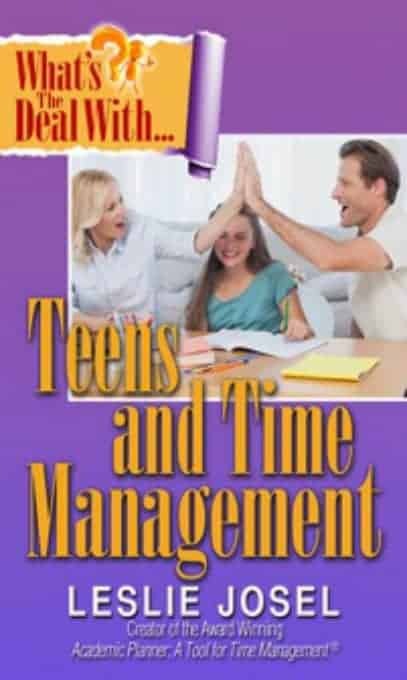 So when I was asked by Leslie Josel to review her book What’s the Deal with Teens and Time Management? I was thrilled. To be honest, this book helped me too. I liked the chapter entitled “How Do I Get My Teen Out the Door in the Morning?”. This is the chapter that I needed the most. She mentions that you should put an alarm clock in every room of the house. Once their bedroom alarm goes off, make their bathroom alarm go off so then if they happen to fall back asleep, they’ll have to get up and turn it off, then now they’re in the bathroom, have to stay up now! Leslie also mentions about having to start a routine before you rely on them to get up by themselves. She says make a chart or write it on a dry erase board so they can just look at it and see what is next on the list. I have started this in my house, I put it on the dry erase board and then put a checkbox, they have the option of checking it off or just erasing it when they’re done with that task. She has a 14 and 16-year-old so she knows how the time management works with the teens. She mentions about having things ready the night before that can be; shower, clothes, and backpack. I’ve also been doing this since my boys were younger, shower before bed unless they have an accident and then it’s in the morning as well and then having their school clothes ready and backpack ready; papers and folders signed and ready to go. This is with just A.M right now, C.J can wear PJs all day. This is something good to work on now if they’re young, and something to get started now if they are teens. I’ve also tried this with my boys but then it becomes too much distraction. They have to keep listening to the song until it ends. But every kid is different so it might work for yours. Leslie mentioned something in the book that makes so much sense. It’s called FOMO, do you know what that stands for? You do and it will cause an ah-ha moment. It stands for Fear Of Missing Out, my boys are all about this. They don’t want to do anything because they are afraid of missing out on everything, whether it’s a tv show they are so consumed by (Minecraft videos by Pat & Jen and Stampylonghead at the moment) or miss out on what their friends are doing. So to prevent this, the tv goes off and doesn’t come on for anyone until they are done with whatever they need to do, whether it’s homework, school work or chores. Go check out her book and come back and tell me what your favorite chapter was.